Shalini Pandey will be seen playing the lead role in 100% Kaadhal, which is a remake of Tollywood hit 100% Love. Latest Telugu release ‘Arjun Reddy’ struck gold at the box office and became a successful film in the recent past in Tollywood. Directed by Sandeep Vanga, Arjun Reddy is the story of a heartbroken man played by Vijay Deverakonda and was very well received by viewers. The film seems to have yielded great results for the lead actors as well, specially Shalini Pandey. Shalini now will be seen playing the lead role in 100% Kaadhal, which is a remake of Tollywood hit 100% Love. The film was launched officially today in Chennai which is being directed by Mouli. 100% Kaadhal stars GV Prakash in the lead role which was played by Naga Chaitanya in the Telugu version. And according to latest buzz, Shalini Pandey may be roped in for Dulquer Salmaan’s bilingual film which will be directed by Ra Karthik. The film is yet to be titled and will be produced by J Selvakumar, reports reveal. It is being said that Shalini Pandey has been approached by the makers but a narration is yet to happen. More details about the collaboration may be revealed in the coming days. 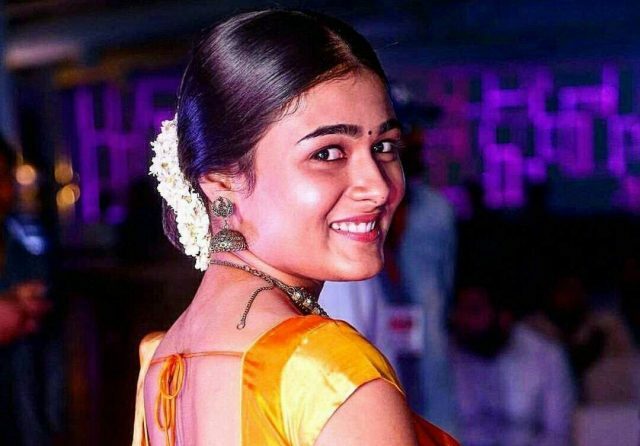 Shalini Pandey, who will start shooting for 100% Kaadhal, is playing an important role in ‘Mahanati’ which is a biopic on yesteryear iconic actress Savitiri. Coincidentally, ‘Mahanati’ stars Dulquer Salmaan playing Gemini Ganesan, husband of Savitri. Dulquer, who just had a release – Solo, has shot major portions for his role in Mahanati and is also simultaneously shooting for his Bollywood debut film, Karwaan.